(Nanowerk Spotlight) The World Economic Forum, whose 2008 Annual Meeting ended on Sunday, has founded the Global Risk Network in 2004 in response to concern that the international community and the global business community were not yet able to respond adequately to a changing global risk landscape. The Program has moved forward in partnership with Citigroup, Marsh & McLennan Companies, Merrill Lynch, Swiss Re and the Center for Risk Management and Decision Processes, and Wharton School. In an increasingly complex and interconnected global environment, risks can no longer be contained within geographical or system boundaries. No one company, industry or state can successfully understand and mitigate global risks. The World Economic Forum, with numerous links to business networks, policy-makers and government, NGOs and think-tanks, is in a unique position to advance new thinking on global risks, to generate risk mitigation measures and to integrate current knowledge on global risks. Over the past few years, the Global Risk Network team has released an annual report. This years' report "Global Risks 2008" was published two weeks ago. In it, as in previous years, nanotechnology was characterized as a global core risk. The report is based on input from a network of more than 100 top business leaders, decision-makers, scientists and other leading academics convened throughout 2007 as part of the World Economic Forum’s Global Risk Network. The topics identified in the report were at the core of the agenda for this year's Annual Meeting. Although nanotechnology has been included in the "Core Risks" group, it ranks well below the majority of risks both on the 'severity' and 'likelihood' scales. The major focus of the Global Risks 2008 report is on four emerging issues which will impact the world economy and society in the decade ahead: systemic financial risk; food security; supply chain vulnerability; and energy. Under conditions of global stress, one core question of global risk management will become more salient than ever: who owns the risk? Without a shared understanding of ownership, achieving the trade-offs which may be necessary to mitigate global risk equitably and sustainably will be extremely difficult. Without clarity on who is responsible for managing global risk, turning aspirations into actions will be impossible. Without frameworks which connect ownership of risk with the responsibility to mitigate it, and which share the upside and downside of risk among stakeholders efficiently, the market mechanisms for managing risk will fail to improve our aggregate global resilience in the face of inevitable risk events. And without leadership from the business and political communities on all of these issues, we may find our global future shaped more by risk events than by our power to anticipate, manage and mitigate them. The report notes that studies reveal health impairment due to exposure to widely used nanoparticles (paint, cosmetics, healthcare). The primary impacts of a potential problem would be on public health, with secondary impacts on investment in a range of nanotechnologies. It also states that increasing human exposure to nanotechnology will increase severity should an event occur, but this has to be balanced against the multiple opportunities created by nanotechnology. Underlining the positive impacts of nanotechnologies, the World Economic Forum's Technology Pioneer program accepted four nanotechnology companies (out of 39) as 2008 Pioneers: Cima NanoTech Inc., Nanostellar Inc., RainDance Technologies, Unidym Inc.
To be selected as a Technology Pioneer, a company must be involved in the development of life-changing technology innovation and have potential for long-term impact on business and society. In addition, it must demonstrate visionary leadership, show the signs of being a long-standing market leader – and its technology must be proven. In their first report, issued in 2006, the Global Risk Program adopted a future-oriented, scenario-based approach in two time horizons: the short-term to the end of 2006, and the long-term to 2015. Two brief scenarios were developed for each risk in each horizon. The base-case describes the likely evolution of the risk along its current trend lines, while the worst-case represents the most pernicious plausible outcome. The risk defined by each scenario was assessed in terms of the likelihood of the scenario occurring and the severity of the impact if it does. In addressing likelihood, actuarial principles were applied where sufficient data existed, though in many cases only qualitative assessments based on expert opinion were possible. 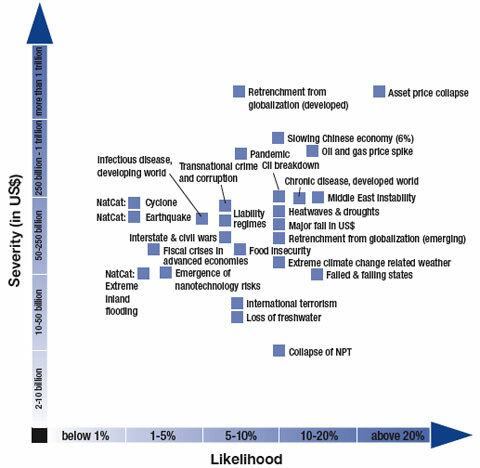 In assessing severity, three indices were considered: asset damage, human impact and impact on aggregate global GDP growth. The highest of the potential impacts was used in each case.